Gene Black an Alabama Artist and Quilter: Getting there! The denim and twill quilt is coming right along. Did you forget about this one? At this point all the rows are sewn together and sewn to the backing. Each row was joined into a long strip then I sewed the rows together onto the backing in a Quilt As You Go manner. You may notice that the points don't match up every time. There are a few lessons I learned making this quilt. 1. Denim is bulky! So seams should be offset or pressed open. Personally I hate pressing seams open. I pressed these to one side thinking that would allow me to nest seams. 2. Denim stretches a bit. I realized that one reason jeans are so comfy is that the weave structure adds a bit of give along with the added strength it gives. This makes it harder to ease in the extra and make the points match. 3. It is even more difficult to match points when you are also manipulating layers of fabric. 4. It gets heavy fast! this also causes drag to add to the other issues. Next time: cut a few of the blocks in half and offset the rows. Here is another photo of it across the bed. The scattered embroideries make me happy. You can see the binding that I did after sewing down the first two rows. I am sure that was the easy part. Now I have to do the other three sides while managing the weight of the entire quilt. Wow...this looks great. You sure hit the high point of the problems of denim sewing. Love the idea of staggered rows....that would help with the seams. The weight is just the one thing we have to deal with. Denim sounds challenging, and I would never notice non-perfect points! It’s really special, Gene, our always-original most creative person! I have a big smile as I read your post! Way back when, denim quilts were the only ones I made, and I knew no different because I couldn't afford to 'buy' fabric. So I had all the problems you talked about, but didn't realize they were problems, lol. 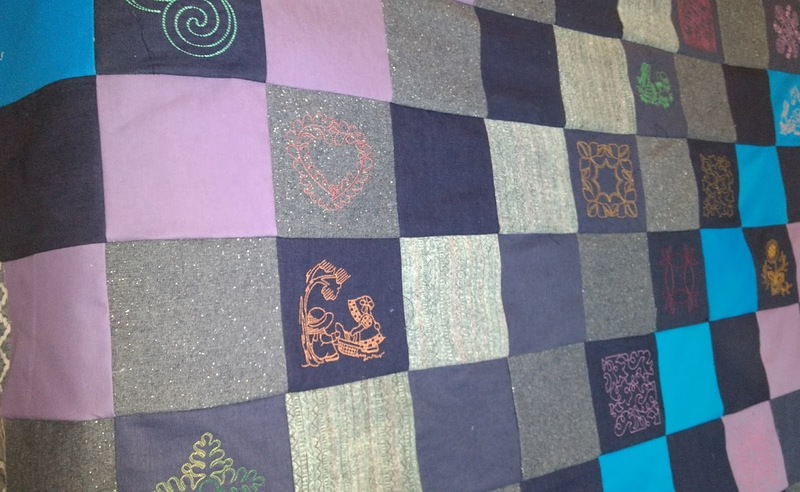 I hand tied my quilts, which was a monumental effort to get the needle and yarn through all those intersections. You're almost finished, and it's looking absolutely wonderful - yay!!!! Looks amazing. I do like the small scattering of embroidery blocks. Just enough to make them feel important but not enough to be drowning in them. 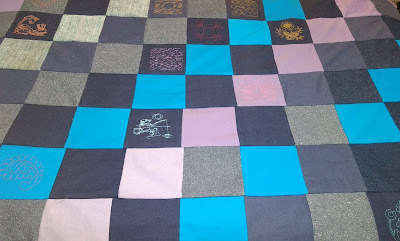 Denim quilts are a beast to move around the sewing table even when I have extra tables to support the weight. Are those blocks magically embroidered by machine? They add a bit of sparkle. I have made not quilts but other denim items like bags and found where the seam makes it thicker, it tends to wear out sooner. Of course things made of denim tend to get more abuse.